We always appreciate positive feedback from our clients. Please take a moment to provide a short written testimonial within the box provided below. Thank you! Jodee and I cannot express the huge thanks and appreciation for your tremendous services yesterday. We could not anticipate at all how everything would happen - we just knew it was going to be emotionally very challenging and impactful. But, with your attitude, guidance, love and genuine care, letting Jackpot go was made that much more with meaning and love. You led us into a place where we were as comfortable as possible and, clearly, Jackpot was as well. We both cannot imagine anyone assisting us through this very difficult action any better than you. The day continued to be filled with lots of tears and lots of smiles of love for our memories of Jackpot. You may remember asking the worst thing JP ever did, and we did remember the funniest ever. Our dear friends who were guardians of Turner - Jackpot’s only friend - had agreed to take care of Jackpot while we traveled over the Christmas holiday. One day they called us and asked “Have you guys ever had a Christmas tree in your house?” We hadn’t and asked why. Well, when Jackpot saw the tree he peed on it! :) — we all cracked up. Anyway, thank you so much for yesterday. We both feel like we are missing a part of ourselves - more than just a part of our family; but, we are better today than yesterday, and know that will continue going forward. Jackpot will always be with us in some way, along with our amazing and loving memories of 15 years (he was one when we chose each other). ​"The "Peaceful Farewell" team was exactly what we needed to get through the tough decision to have our beloved Tito put to rest. They came to our home with kind hearts, understanding and professionalism that made this terrible day a bit more manageable. Our family will NEVER have one of our animals put to rest outside of our home and will always call this team in our time of need. Thank you so much for what your company does and how you make the process a loving and peaceful one that takes place in the animals comfort zone." "Our family would like to extend our thanks for the compassion and care you and your assistant gave during the very difficult decision to let our Marley go. You reassured us that we were making a wise decision and helped us cope and mourn our family member. Thank you for your patience and understanding during our difficult time. We will truly miss Marley but we know he went out with us by his side and lots of love. " "My family and I are incredibly grateful for the services provided by A Peaceful Farewell. Our family Dog of 12 years, Zoey was sick and became increasingly ill in a matter of days. Our family could see it was time as she was suffering. The immediate response we received and was a relief when Dr. Lawmaster assured us they could come the next morning to relieve our dear Zoey of her pain. During this difficult time, we were shown so much caring, compassion, and sympathy. We wouldn’t have wanted it any other way. " "Dr Kristin came out to our home after hours and on an emergency call to help relieve our precious dog Stella's suffering. I can't thank her enough for being so sensitive of my broken heart in the immediate situation." "A peaceful Farewell made the passing of our oldest dog Caponie, although never an easy thing to do, they made it so peaceful. I will recommend them to any family or friend. His last breathes were eating half the bag of his favorite cookies and being held by us. What a wonderful experience. They are angels. They are that little bit of light that shines through at such a dark, upsetting time. I could never thank them enough for being there with us. Rest in Peace Buddy. We'll see you again." "The Curtis family wants to send a sincere thanks to Dr. Kristin, who came to help our Sweet Ryelee find final peace on earth and transition to her new life with her Dog Buddies in Dog Heaven. It is not an easy decision to make when it comes to a loving family member, such as Ryelee, who was a wonderful part of our family for almost 15yrs. We knew we had made right choice for a our sweet girl, when Kristin and company showed up. They were so gentle and caring in those final moments, with both Ryelee and our three Daughters. We know Ryelee is free of Pain and we thank you Kristin for allowing Ryelee to feel peace in the end." I just wanted to say Thank you Dr. Lawmaster for making this very hard day a little easier for my family. We had to put our old girl Woo who is 16 down 12/19/2017. We are grateful for your compassion you made our family feel like we made the right decision. We are all very sadden for losing our beloved girl. Now she is across rainbow bridge running around like a happy painless pup. "​Having an in-home service for a peaceful end of life is truly special. Surrounded by the familiar comforts of home means less stress for the pet. Although it's a difficult decision, Dr. Lawmaster we so very caring and compassionate. We can't thank her enough for sending our pet, Zemke, off to heaven in the most peaceful and caring way. We miss you Zemke! RIP"
"​You came today and gave my baby a beautiful farewell. You were caring and so very kind to all of us. You gave us all time we needed with him and took such great care of him. Thank you for sending off with love, caring and beautiful hearts. " "​I just wanted to thank the Drs. Lawmasters for helping my old dog, Piper. Even though I miss her everyday, I am so grateful for your services to help her go in a painless way. Your sympathy and compassion for my family and your kindness towards Piper during her last few minutes really meant a lot to me. Both of you made this difficult time easy for both my family and Piper. I am devastated at the loss of my best friend but I will always be thankful to you two for helping her get to a better place." "Thank you for coming to my home to help make that peaceful transition for Nikita. Nikita taught me so much and she was so smart. She knew I had a hearing impairment and watched over me. Nikita knew sign language and learned how to open doors on her own at 6 months. I have so many stories to share about Nikita and my heart aches for her. Nikita knew her time had come. Before she fell asleep in the 10 minutes grace period, she laid down and looked up at me. With her final act being she lifted up her head and kissed me. I am in tears as I write this. I know in my heart, this was the best thing to do. I felt completely relaxed and okay with opening up around both Drs. Lawmaster. The handled everything professionally and with deep compassion and care. They allowed me to take the time I needed to say good bye to my friend. I am eternally grateful to both Doctors. Thank you. From my heart." "I just wanted to send a quick thank you note for Dr. Kristin Lawmaster's help with our sweet golden retriever, Lucky. We are very thankful and grateful for your services in addition to the compassion you showed for Lucky. We cannot thank you enough! While we miss him every day, we wanted to share with you that we have been able to welcome a new member to our family, Charlie (see photo). He doesn't fill the hole in our hearts from Lucky's passing, but he definitely brings some joy to our family and home." "During the course of one's life there are times when difficult decisions must be made concerning those within the family. Such a time came for Linda and me when we knew it was time to allow our beloved Foozie-boy to leave the physical...and pass into the spiritual. It was your professional manner and service that made a very difficult time...much more tolerable as your expertise took control of our a difficult situation and made the entire process easy for us...but more importantly, much more more easy for Foozie-boy. It is with much respect and gratitude, that we thank you very much for your help and service. We wish you continued success...and may all the good things of the Universe come to you and yours. "Thank you Dr. Kristin for making this very hard day a bit easier. We put our "chocka boy" down in the very spot he would wait for us to come home from work everyday. We bought him his first vanilla ice cream today and he loved it. He's now running like he use too and no more pain. I will always think of him when I hear Pink Floyd's comfortably numb, how bizarre that that song come on just as my boy faded to sleep. Nice we could say goodbye on his turf not a cold vet office. Thanks again ladies for everything ...love his paw print you made us, it was such a peaceful farewell." "I want to Thank Dr Lawmaster for her help. Our old dog and beloved pet had been diagnosed with cancer and she deteriorated very quickly and I needed a same day appointment. When I reached out to A Peaceful Farewell, Dr Lawmaster returned my call immediately but due to her existing schedule was unable to see us however she was committed in helping us find a solution. I was so grateful for her help, she was instrumental in ensuring our dog did not suffer. Thank you! " ​"Thank you again Dr. Lawmaster for helping to assist in Zoey's next journey without pain or fear. I felt at ease and knew I made the right decision as soon as you both entered our home. Thank you for assisting my sister in the same month with her beloved Sarah. You both are truly blessed and gifted and we appreciate the fact that you could assist right away." "You are truly angels and we are so thankful for you in our time of need "
"This is for anyone considering home euthanasia...I HIGHLY RECOMMEND IT. I totally struggled with this decision, especially since my dog was only 8 years old (bone cancer). I cannot thank Dr. Lawmaster enough. She was absolutely wonderful and as compassionate and caring as could be. As awful as it is to lose a pet, this was by far the best and most humane ending that I could have ever given him. He was at home, surrounded by familiar things and smells, and had his best buddy (our other dog) by his side. He was comfortable-- not all worked up and agitated like every time at the vet office. My children were not home at the time, but were very happy to see the paw print casting that was made for us. The hardest part about being a pet owner is that eventually we have to say goodbye. When that time comes again, I will definitely be calling A Peaceful Farewell. Thank you. again!" 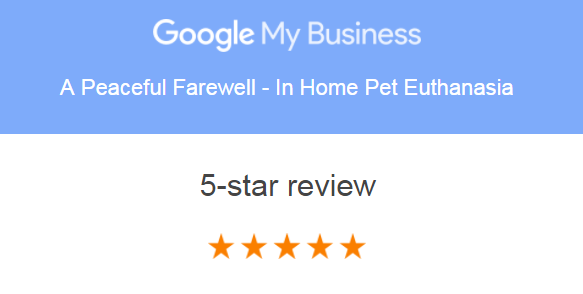 "What a wonderful service you provide! Your professionalism and compassion made all the difference. You had nothing but love and kindness to give to Lola. She was always happy to meet new people, but she seemed especially drawn to you. Perhaps you were the angel who came to walk her over the Rainbow Bridge. Thank you again!" "Thank you very much for your kindness and all the compassionate caring in our difficult time to say goodbye to Kitty. Our hearts are so heavy with grief but we know that he is in a much better place and we will all meet again. Thank you God for people like Dr. Lawmaster. Kitty is gone but never forgotten. Thank you again." "I wanted to share my experience to those that are not sure this is what they want for their pet. I lost two of my closest and best friends within 2 days of each other. Both were yellow labs, 18 1/2 years and 16 years old. They were there for me for most of my adult life, so their passing was not easy for me. When it came time for a decision, the Drs. Lawmaster made me feel confident I was doing what was best for my long life companion. They were compassionate and treated my friend with the utmost respect. I felt his passing could not have been more peaceful. Thank you for letting me feel at peace as well!" "Thank you for your compassionate care of my best friend Leo and of me during a most difficult time. My heart is still broken from losing Leo. But, to have you provide the care that you did in our home was so very comforting. I was able to hold and love Leo as he saw his way away from this world in the most peaceful and gentle way. I am grateful for you for the act of kindness and mercy that you have as your calling and profession. It meant the world to me and your care comforts me still." I wanted to take the time to thank you for your complete attention to details and care taken for our cats during the very difficult time. You were so very attentive and careful with us on Friday afternoon. You somehow made a terrible situation more tolerable. You are very much appreciated, and I will never forget you both. May Ashley and Tawney rest in peace." "A few weeks ago our beloved, Aragon, became ill and no medical treatment was making a difference. He continued to deteriorate. 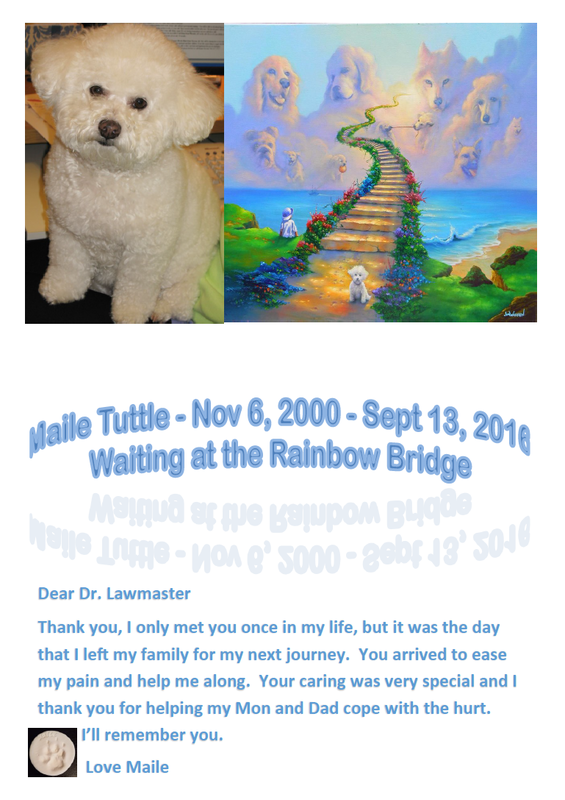 When we decided that his suffering was increasing in intensity and it was time to let him go, we found Dr. Lawmaster’s website, A Peaceful Farewell. I sent an email inquiring about her services. She called that same evening and we were able to schedule an appointment with her the next day. When Dr. Lawmaster arrived, her compassion and quiet, professional demeanor calmed our nerves and after a quick check of Aragon, she told us that he was in congestive heart failure and that we’d made the right choice. Although we had previous experience with other pets, it was comforting having her explain the procedure again and it kept the focus on Aragon. During the entire procedure we never felt rushed and were able to spend as much time as we needed to say goodbye. Taking Aragon on a stretcher and covering him with a blanket, showed a level of respect and compassion that we appreciated immensely. While we are devastated by Aragon’s loss, we thank her so much for helping us get through one of the most difficult days of our lives." "Thank you so very much to Dr. Kristin, who came over to put our Mabel to rest, who was hurting and tired of the struggle. I was so grateful for not only Dr. Kristin's professionalism, but genuine compassion and care for us as well as our beloved Mabel-girl. It was a terrible day, but their presence and care were huge blessings to us in the midst of it all. Thank you so very much. You have given us a peace at the end of a very trying season." "Dr. Lawmaster and her assistant came to our house 3 weeks ago for our Roo, a 10 year old red lab. She suffered from myelopathy, and was having a difficult time. I can't say enough good things on how they were with our Girl. They gave us the time we needed to say goodbye and the space to go with it. As one of the hardest things we have ever had to do, we did not know what to expect . Well we will never let our future dogs go over the rainbow bridge in an office environment again. Dr.,Lawmaster was wonderful ! Thank you for everything." Ron and I would like to thank you for your professionalism, compassion, gentleness, and kindness. We've had so many animals and have not always had a good experience with sending them over The Rainbow Bridge. What we experienced while Lilly was in your care meant so much to us...and always will. We've never had a fur baby cross over as peacefully and beautifully as Lilly did. That was possible for her because of you. Thank you so much for making her loved, comfortable and safe during this sorrowful transition. We are relieved that Lilly is finally not feeling any pain. We know The Lord, along with all of Lilly's brothers and sisters, were awaiting her arrival. I have no doubt that they didn't waste anytime running through a field of wild flowers together as they play like pups again. My eyes fill with tears and then a smile appears because of the gift of memories that Lilly left us. We are going to miss our baby girl. We loved her very much. I know if Lilly could have said it, she would have thanked you as well. May life bring you a reflection of the kindness you've shown to others. You guys are phenomenal. Thank you from the bottom of our hearts." "Dr. Kristin, I wanted to thank you for helping me put Ezra to rest. It was the hardest thing I ever had to do in my life. You helped me go through with my decision without any regrets or guilt. I feel at peace and know Ezra is also.Thank you." THANK YOU from the BOTTOM of our hearts! You have NO IDEA how much your kind actions and assistance allowed us to peacefully go through SUCH a hard time in our lives. We really had felt judged by so many people, which made the decision a LOT harder. Your first email to us actually helped us make the RIGHT decision. It has still been REALLY hard dealing with what just happened, but we have ZERO regrets. It is thanks to you that we have been able to handle what just happened, and your professionalism made it tolerable. We felt COMPLETELY SUPPORTED, and we felt that Lou was COMPLETELY LOVED AND SUPPORTED the entire time. Thank you again! Your kind actions have helped us heal more than you will ever know. We have told SO MANY people about you and your BEAUTIFUL company. We are actually healing and thinking about getting another dog (We love dogs TOO much to never have another). I really promise that it was because of the kind that way you handled things, that has helped us to get to this point. Had you not done what you had, we would swear off the heartbreak of dogs forever. THANK YOU (and your Husband) SOOOOO MUCH for doing what you do. You change lives. Really, you do! All our thanks, appreciation, and love..."
"We said goodbye to our beautiful lady Bailey yesterday. She was a 13 year old Golden Retriever who grew up with our family. We received a devastating diagnosis of Hemangiosarcoma in November and are very thankful that we had two months to say goodbye and prepare ourselves for the day we knew would come. Her last days were spent being loved round the clock and spoiled rotten. Her last meal was her favorite.....steak, though she only ate a couple of bites. When we could no longer bear to see her in pain and knew that the only smiles she could muster were to make us feel better we knew the time had come. With love and great compassion Dr. Kristin came and gently helped our Bailey drift off to a comfortable sleep. We are so thankful and grateful for the kindness and compassion that you showed. We are beyond devastated but having the blessing of those final moments with all of her favorite people around her, we know Bailey was ready to go and we could say goodbye." "Yesterday we said our final Goodbye to our beloved little girl Precious. As difficult a decision it was to make we knew it was time and couldn't bear to see her suffer any longer. Precious was terrified her entire life by trips to the Vet and so I didn't want her final moments to be filled with fear and anxiety. Dr. Lawmaster made it possible that Precious could spend her final moments in the comfort of her home, surrounded by her family. She treated her with compassion and care and allowed her to peacefully drift off to sleep before making her final transition. While losing Precious was heart breaking to us and we will miss her everyday it gives us comfort that we were able to send her off without pain or fear and by people who treated her with the dignity and respect she deserved. Thank You Dr. Lawmaster, this is such a valuable service that you provide." "Dr Kristin, I just wanted to thank you again for helping me and Noli yesterday, I was so scared for her and felt so relieved once you came over. I wanted to call you and thank you but knew I would start crying again so I thought I would just send an email. I can't even begin to express my gratitude. I will never again go to the vets office to put one of my animals to sleep if I can help it. We are all sad that Noli is gone but I am so grateful I found you.....God bless and thank you so much." "Odie my buddy was 12 years old and a huge part of my life. I was looking for a peaceful way instead of having my buddy have to wait in an emergency room for his turn. Then I came across Dr. Lawmaster and soon realized Odie was in great hands. Kristin was super kind, patient, and handled my friend with care. Thank you again for letting my bud go to the next phase of his life in peace." "Dr. Kristin, thanks for helping us earlier this evening with Jasmine. As promised, Jasmine slipped away in a peaceful sleep. I really don’t know how you do what you do but your compassionate and thoughtful approach was really appreciated. " "Dr. Lawmaster was wonderful and made this very difficult process as warm and caring as possible. We got reassurance that we were making the right choice for our Sammy girl. She was my first dog (chocolate Lab) and we had so many special memories. Saying goodbye was so very difficult and we appreciated the genuine caring and warmth we received. I am so glad we made the choice of saying goodbye at home. Sammy deserved nothing less." "Dr. Kristin made a very difficult decision and process as caring as possible. I was reassured that I was making the right choice for Lacey . Saying goodbye was so very difficult and I appreciated their caring and warmth . I am glad I made the choice of saying goodbye at home. Lacey deserved nothing less. If you need to make this most difficult decision. do your self and your pet a favor and call her, you will be very glad you did." "Dr Lawmaster, thank you so much for coming to our home to provide Zeus with the release that he needed. It was the most painful decision to realize that the time had come to let Zeus go yet we knew it was the right time. Your compassion was much appreciated. You made this a very special and caring time for us. You understood our need to have that time with Zeus to say goodbye. I did not get a chance to thank you properly through all my tears. However the service that you provide is immeasurable. Thank you for the bottom of our hearts!" "Dear Dr. Lawmaster, words are not enough to express my deep gratitude for helping me with understanding using your methods of helping Bob into her final stages of life. She went very peacefully which helped me into the process of grieving knowing she had not suffered. You perform a difficult process with grace, leaving me with tender memories of her final moments. Thank you." "Dear Dr. Lawmaster, thank you so much for the thoughtful card you sent us and also for the tender care you showed our sweet Snickers and us on Tuesday this week. We appreciate how you were sensitive to our love for her and your professionalism as well. The paw print with her name was so unexpected but something we will always treasure in her memory. Choosing to have you come into our home was the best choice for Snickers and so much easier on her, although the decision process is so hard on us. Thank you again and may God bless you and this service you provided for us." "Dear Dr. Lawmaster, thank you so very much for your care and compassion and making Kneady’s final moments as peaceful and painless as possible. Kneady was the best cat. He got along with all animals, he was loved at the vet’s office, he never complained about anything, and he was always there for me. The decision to put him down was a difficult one. But when it was done, thanks to you, it was the right one. Thank you for the paw print also. It is a wonderful daily reminder of such an amazing gift from God. In closing— I do not regret the decision, and the process could not have gone better. You will be highly recommended to anyone I know who is considering the decision." "I do not know where to begin. This was the most painful decision I have had to make in my life, "Puppers" is one of my kids. When Dr. Kristin came to my home she was so gentle with not only Puppers but with the whole family. She was very compassionate. She took the time to explain what was going to happen and answer any questions we had. My boy hated the Vet and it was always very stressful for him, because of Dr. Kristin my beloved Puppers was able to leave this world in peace. Thank you Dr. Kristin." "Dr. Kristin, we knew the time had come for Mischief to leave us and we cannot thank you enough for coming to make her transition comfortable for her. Because of you, she was able to fall asleep in my arms, at home, where she wanted to be. Thank you for your gentleness, compassion and understanding. You will never know what a gift you gave to us to know that she went peacefully and without any stress."